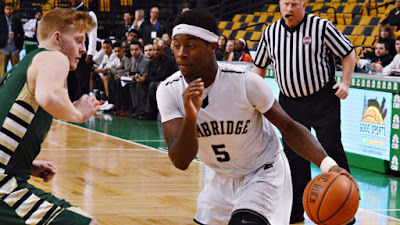 Cambridge's Jakigh Dottin. Photo courtesy of ESPN Boston and Brendan C. Hall. Mass Madness is finally here.The MIAA boys and girls basketball tournaments start this week and you can find nightly coverage on SuiteSports through the state finals at Springfield College. Ed. Note- Not every one of out contributors has made pick for every bracket since, uh, not all of us have seen enough of each region. For instance, editor Joe Parello went light on the Eastern Mass picks, but picked up the slack for Nate and Feldy in Central and Western Mass. Enjoy! Nate Weitzer’s Pick: The D1N bracket, and the state title for that matter, is the Falcons' to lose, as Cambridge brings back the core of last year’s championship roster. While Central Catholic played Cambridge tough at home to end the season, the Raiders will have to get past Lynn English and Methuen or Andover before potentially drawing Everett in the semifinals. The Crimson Tide is definitely a sleeper to watch in the event they meet Cambridge down the line since Ghared Boyce and company will not back down from anyone and they have the size to match up with the Falcons down low. Matt Feld’s Pick: How about some hot takes right off the bat! Central Catholic is the only team thus far to give the Falcons a real run for their money, and with a potential matchup looming in the Sectional Final, there is no reason to believe the Raiders can’t do it again. Rick Nault’s teams have enact for muddying the waters, making the game physical down low, and turning the contest into a rock fight and that is exactly what they will do come out victorious in a rematch from the final regular season game of the year. Joe Parello's Pick: I don't want to overthink this- Cambridge has been unstoppable this year, but I do agree that Central Catholic, just by virtue of its style of play, could give the Falcons another decent game. Everett has talent, and I think Methuen could be a dark horse, but let's be real; This is Cambridge's bracket, and state, to lose. Weitzer's Pick: This is a very deep field led by the undefeated Spy Ponders, who proved that their record is no fluke by taking home the championship at the Comcast Classic last Monday. Yet the most talented squad in this field is fifth-seeded Brighton, as the Bengals return most of the team that advanced to the sectional finals last season and are fresh off a Boston City League title. After their win over Tech Boston, coach Hugh Coleman said that the Bengals can basically only lose if they beat themselves, or perhaps if they run into old nemesis New Mission in the sectional semifinals. Feld’s Pick: Brighton may have fallen in the finals of the Comcast Tournament, but they certainly proved their worth against a couple of Division 1 powers in Needham and BC High. Wilson Veal and Mykell Derring provide threats from three point land while Jordan Galloway runs the offense. The key for the Bengals though is their size in the paint, and the fact that no one other team in the section can match up with the duo Jerrod Clark of Jordan Diaz. Parello's Pick: Call me crazy, but I think this bracket lines up really nicely for Belmont to make a deep run. The Marauders won't have a game off, but also have the talent to play with Lynn Classical or Salem in the quarterfinals, and can certainly shoot their way to an upset of Marblehead, should they see the Magicians in the semis. The other side of the bracket is brutal, though, and I think whichever team survives that potential Arlington-New Mission quarterfinal probably becomes the favorite. They've been a great story all year, so give me the Spy Ponders, but man this bracket is loaded. Weitzer's Pick: The Bucs of Bedford are certainly a team to watch given their recent run of success in the state tournament, but Weston seems to be a cut above in terms of senior leadership this year. 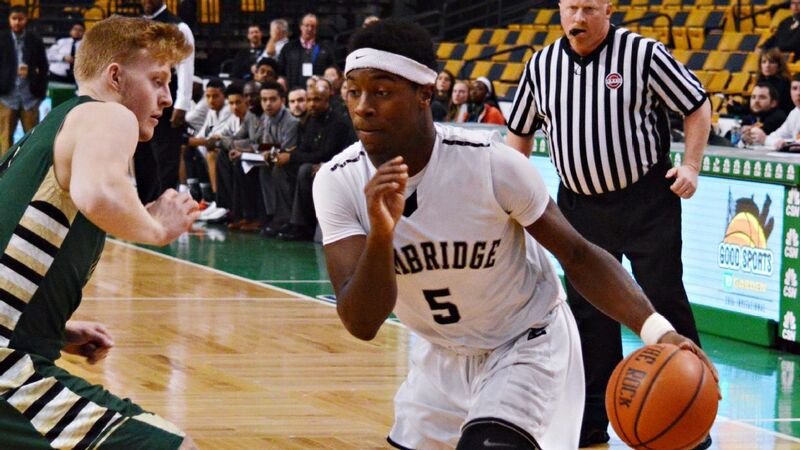 The Wildcats have won 13 of their last 14 since getting crushed by Cambridge and took care of Bedford in a 78-74 thriller on the road, which is the team they’ll likely face in the quarterfinals. Weston has the chops to win close games and do what it takes to navigate a tough tournament field. Feld’s Pick: Weston sophomore Kyle Murphy steals the show in this years division 3 north tournament. Throughout the regular season Murphy displayed an ability to shoot from the beyond the arc, attack the basket, and rebound. Combine that with Weston's length on the defensive end and the Wildcats will be a very tough out. Weitzer’s Pick: It’s been a rollercoaster season for the Spartans of St. Mary’s (Lynn) but the defending D4 state champions are more than capable of turning it on during the playoffs. They’re still loaded with talent in the backcourt as well as up front, and are one of the favorites in this bracket for good reason. Feld’s Pick: Hamilton-Wenham showed that they can play with the stiffest competition in Massachusetts when they took St. John's Prep to overtime on the road just two weeks ago. A potential matchup with St. Mary's in the sectional semifinals would be a surefire dog fight, but the Generals are the favorite to return to the Garden for the second time. Nate Weitzer’s Pick: This bracket is loaded as per usual and seems wide open based on the results during the regular season. BC High edged Mansfield at home but lost twice to CM in February, while Needham and Newton North have traded blows throughout the season. I’ll stick with BC High as the most complete and experienced team that should be able to navigate this field and meet the D1N champion at the TD Garden in the state semifinals. 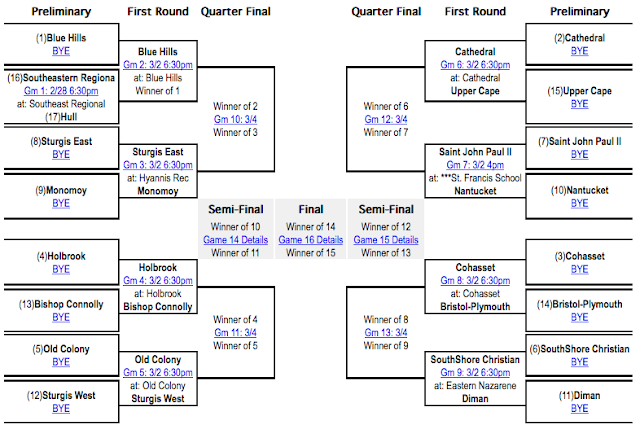 Feld’s Pick: This section is Catholic Memorial’s to lose. After all, they are the three time defending south champions. That being said, the Knights have a lot of inexperience, with a fair amount of the roster from last season – most notably Matt Hanna and Brandon Twitty – having graduated. BC High is the most talented team in the section lead by Carl Pierre and Travis Evee, and considering the Eagles played 14 of their 20 regular season games away from home, they should be more than prepared for the pressure that the state tournament brings. Parello's Pick: I guess I have to be the guy who picks against BC High. Mansfield is rolling, and with a balanced offensive attack, and a solid core of veteran leadership, I wouldn't want to play the Hornets right now. I do love the idea of CM, the team that has owned this bracket of late, being a dark horse, but I think the Knights get nipped by Mansfield before they can take out BC High a third time. Weitzer’s Pick: No team in this bracket has been battle tested to the same degree as tough Boston City League programs O’Bryant and Tech Boston. The Tigers appeared to be a year away from a deep tournament run in 2016 and now they’re fully capable of winning the entire D2S bracket with a senior-laden roster surrounding sophomore sensation Rivaldo Soares. If the 4 seed can get past Tech Boston in a potential quarterfinals matchup, they should be able to advance all the way to the TD Garden. Feld’s Pick: Whitman-Hanson took a trip to the TD Garden last year and the Panthers are destined to return there once again. They won eight straight to finish the year including a big win over Bridgewater-Raynham and Nikko Raftes has the ability to pour in a half dozen three pointers on any given night. Of course, Rivaldo Soares and O’Bryant could certainly pose a challenge. Weitzer’s Pick: The sledding is tough for Cardinal Spellman beginning with a first-round matchup against 2015 D3S champion Old Rochester, but the Cardinals should be up to the task. 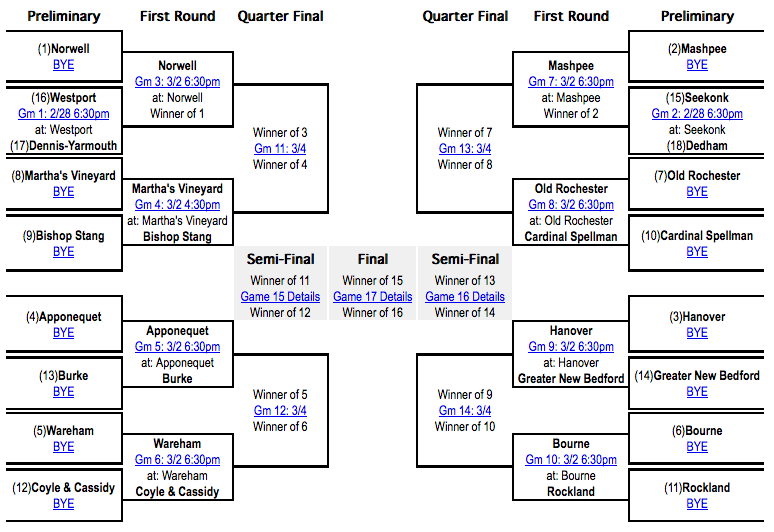 That being said, a top seed such as Hanover (No. 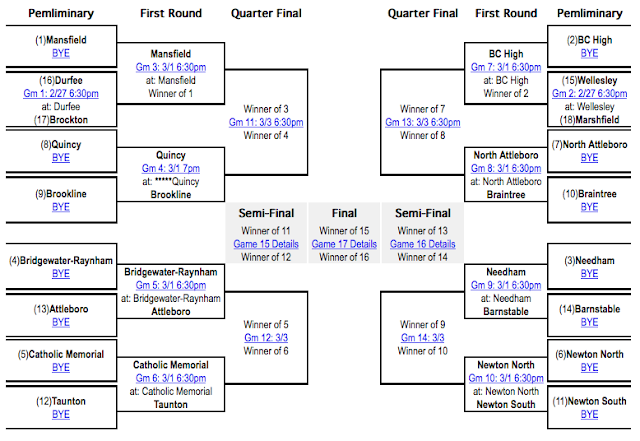 3 in the bracket) is positioned to earn a bit more rest with opening games against Greater New Bedford and either Bourne or Rockland and if the Indians meet a tired Spellman squad in the sectional semifinals, the winner of that matchup should go on to win the entire bracket. Feld’s Pick: Junior guard JP Landry leads the Indians of Hanover to the TD Garden as the basketball team looks to follow up on the football team's state championship. 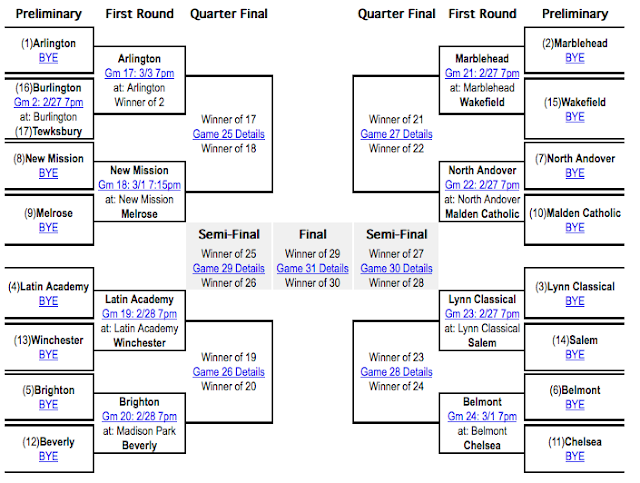 Weitzer’s Pick: If the Panthers of Boston Cathedral don’t blow through this bracket and reach the EMass finals at TD Garden, it should be considered a massive disappointment. Led by dynamic point guard Calvin Cheek, this is one of the most talented teams in the state and they’ve been tested against D1 powers such as St. John’s Prep and BC High this year, so they should be able to handle the competition in the D4S bracket. Feld’s Pick: Calvin Cheek is one of the top scorers across Massachusetts, possessing quickness, three pointer shooting, and terrific ball handling abilities. Cheek is complimented by three point threat Khalil Blair, making the Panthers of Cathedral the odds on favorite to hoist the Division 4 South crown. Weitzer’s Pick: Over the past several seasons Franklin and St. John's (Shrewsbury) have dominated this bracket and I don't expect anything different this season. The Panthers of Franklin have been clicking since Connor Peterson entered the fold and they have a star freshman in Chris Edgehill that should help them navigate this bracket and win some close games on their way to a potential state finals appearance. 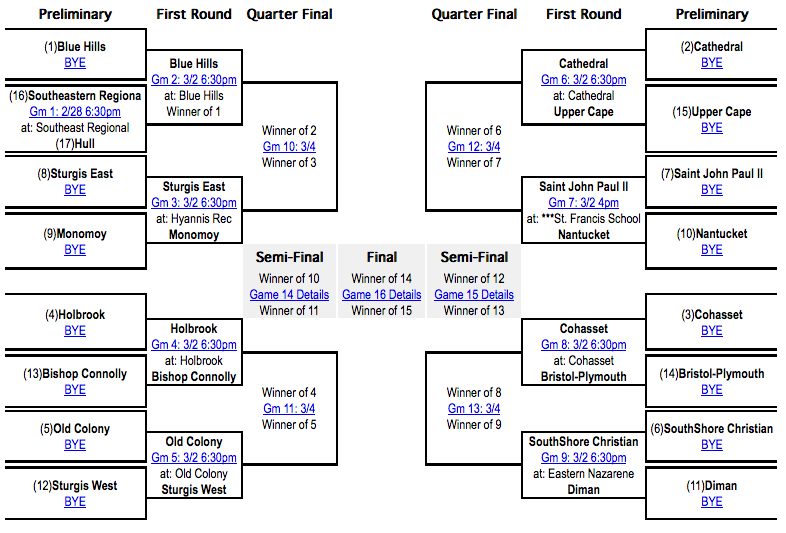 Feld’s Pick: This is the year Franklin finally break through and get past St. John’s (Shrewsbury). The Panthers youth is cause for concern, but Chris Edgehill and Jalen Samuels provide quickness and athleticism in the backcourt while Connor Peterson is a matchup nightmare for opposing teams down low. Parello's Pick: St. John's and Franklin are clearly the teams to beat, but Holy Name is a more balanced team than people give the Naps credit for, and Algonquin, though young and undersized, can beat anybody when shots are falling. I'll go with legendary coach Bob Foley and St. John's, because the Pioneers may be the best defensive team in the bracket, and guards Tyler Mola and Alex Bradley are due for some hot shooting nights. Weitzer’s Pick: Just like in the NCAA Tournament, there are always some dangerous low seeds in the MIAA state tourney and Marlboro is definitely a sleeper to watch in this bracket. If the Panthers get past Milford and knock off top-seeded Nashoba, that would potentially open things up for Concord-Carlisle from the 4 seed and the Patriots have the talent to go all the way in D2C with Spencer Patenuade and David Poor leading the way. Feld’s Pick: The Patriots finished the season strong, winning eight in a row to finish 15-5. Spencer Patenaude is the focal point for Concord-Carlisle, possessing a dynamic offensive artillery, while David Poor is a solid presence down low. Look for Milford to make some noise, as they have proved their worth by hanging tough with Mansfield and knocking off North Attleboro. Parello's Pick: I still believe that Marlboro is the most talented team in this bracket, led by the trio of Chris Doherty, Owen Cappadonna and Joao Mendes, but something just hasn't been right with the Panthers down the stretch. 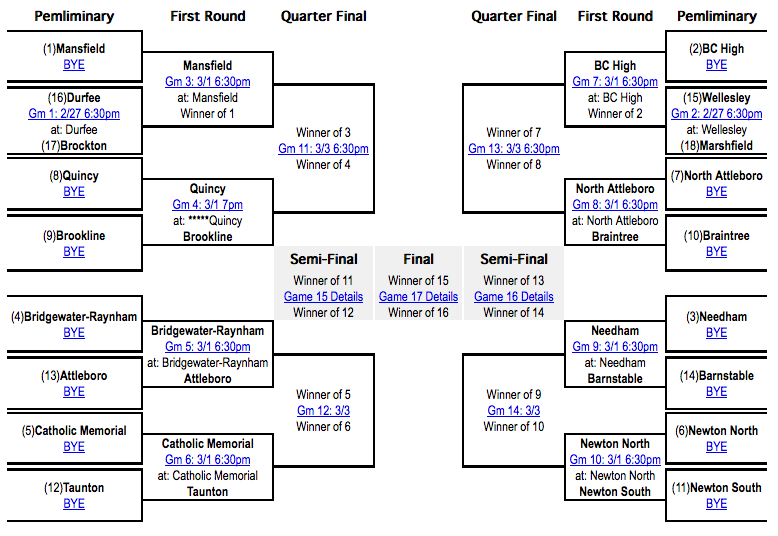 Nashoba is similarly limping into this one after a disappointing performance against Westboro at the Clark tournament, and Groton-Dunstable also had a letdown at the Clark. Who's left? Only the defending champion Concord-Carlisle Patriots, who happen to be surging right now. Parello's Pick: After watching Bartlett Saturday night in the Clark Tournament large finals, and looking back at the Indians' impressive resume, it's hard for me to pick anybody else. Senior forward Tyler Davern simply does it all, and Bartlett also has an array of athletic and skilled guards who push the pace in its run and gun offense. Parello's Pick: Maynard is coming off a big win over Hopedale in the Clark small school finals, and man is this team impressive. The Tigers do not look like a D4 Central team, boasting a number of wings and forwards with size, skill and athleticism. If this team gets in the open floor, they have a few guys who can dunk on you, and star guard Corey Olivier is one of the best players in the state, regardless of division. Weitzer’s Pick: You can never count on Springfield Putnam with that program's pedigree, but this sectional title should go to the Beavers rivals in Springfield Central. Led by 6-foot-7 center Jorge Torres, the Golden Eagles have dominated the competition out west and beaten nearly every one of the teams in this bracket at least once already this season. Feld's Pick: Springfield Central showed via a big win over Springfield Putnam at the Hoop Hall Classic that this is their year to break through and knockoff the Beavers en route to a Division 1 West Title. Still, do not count out Putnam, as the remnants championship pedigree from the last four plus seasons is still present. Parello's Pick: Jorge Torres leads a Springfield Central team that is the most talented in the bracket, and the Eagles will be a threat to play in the state finals across town at Springfield College. Honestly, the way that they've handled Putnam already this year, I don't think this bracket is much in doubt, but Amherst is having a nice year and could be a tough out in the finals. Parello's Pick: Taconic has had a great season, but just couldn't keep up with regional favorite Longmeadow earlier this year. 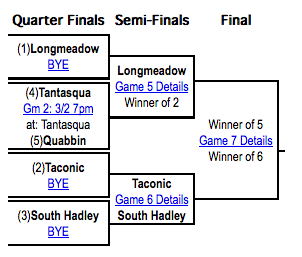 Tantasqua, which played most of its games out in Central Mass, is interesting, but this is another bracket where I don't want to overthink things. The Lancers are the team to beat. 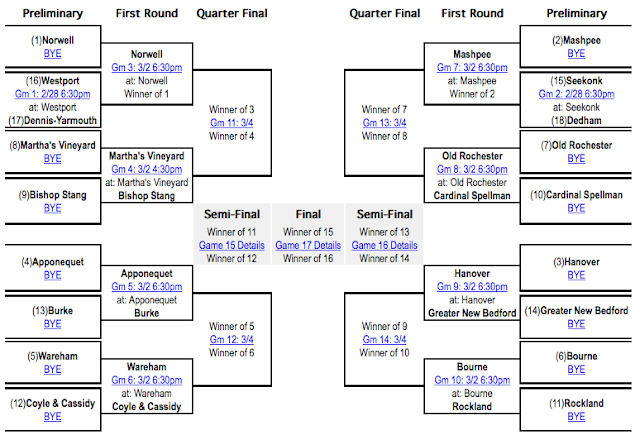 Parello's Pick: My knowledge doesn't go too deep in this bracket, but I do know that Sabis is by far the most battle-tested in D3 West, and has a recent win over a pretty good Minnechaug team. The rest of the bracket is full of talented, but untested competition. Parello's Pick: High-scoring Hopkins Academy has dominated D4 West all year, and enters the bracket as the clear favorite. Just staying within 20 points has been an accomplishment for Hopkins' divisional foes this year, and the Golden Hawks also have wins over higher-division opponents South Hadley, Palmer and Mahar.